Onslaught has made the Combaticons into a nearly unstoppable strike force. He commands his team with the precision of a general and expects them to carry out his brilliant plans to perfection. Onslaught�s alternate move is a nondescript anti-aircraft truck. It�s nothing that I�m fond of, and it really doesn�t bring much to the overall picture. The paint applications are bland (which I suppose is OK for a military vehicle?). The truck mode is mostly a grey/green color with some black and light grey thrown in. The middle part of the vehicle mode is rather open due to the transformation. One other issue is the obvious Bruticus head poking around on the top of the vehicle. It isn�t hidden well at all, so you just have to pretend it isn�t there. The truck warrants a solid �meh� in looks. If there�s some positives, it�s that molded detail is done really well, and it rolls along nicely. You can also use Onslaught�s guns pegged into the top for the �anti-aircraft� portion of the mold. The drawback? The guns don�t swivel side-to-side. They swivel up and down, but the range of motion leaves a lot to be desired from a play standpoint. Needless to say, Onslaught�s truck mode is my least favorite of the two. 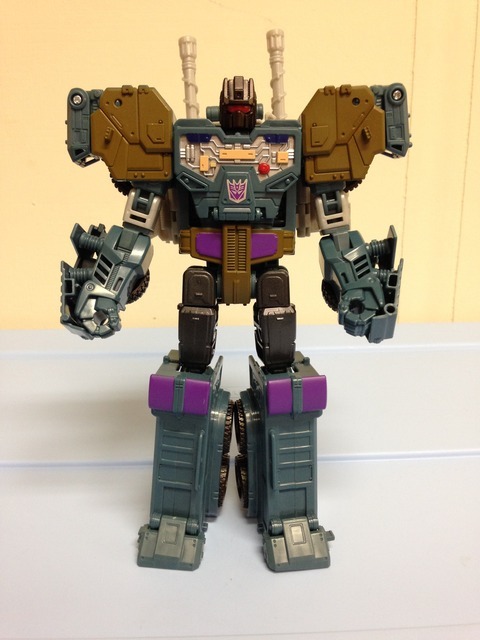 Aesthetically, Onslaught�s robot mode has a lot going for it. 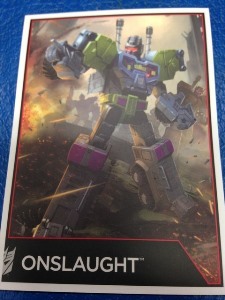 Being a retool of Hot Spot, this version of Onslaught hits the nail on the head. I�m not sure if you could ask for a better representation of the original character. The colors are spot on, and molded detail is great. The only downside is his small backpack where Bruticus�s head resides. As for paints, there�s a lot of apps in the chest plate, and enough other colors here and there to break up the boring green/grey of the truck mode. The head mold is done well, though the joint is a little tight on the swivel. I would have liked it to be on a better ball for range of movement. Speaking of range of movement, Onslaught can move with the best of them. Joints are quite plentiful, and nothing is too hindered to be a problem. The only real problem is the lack of balance. I think the root cause is in the ankles, as there�s no bevel to them. It ends up making him a slight chore getting him into action positions. Otherwise, his arms move well, and you can do a lot with Onslaught. Getting him into robot mode from truck mode is a snap. Simple transformations are a staple of the CW line, and Onslaught is no different. There�s no trickery or anything flashy, just a good, simple transformation. Transformation Design: 4 You can tell he�s the core of a Combiner. The transformation isn�t bad, it�s just slight parts-shifting to get him into truck mode. In the end it�s underwhelming. Durability: 9 Seems pretty rock solid all around. Fun: 8 A simple toy, and when used as a Combiner, Onslaught is great fun. Otherwise he�s still solid on his own. Aesthetics: 7 Onslaught looks great in robot mode. The alt mode leaves a lot to be desired though. Articulation: 8 His arms have a great range of movement, and so do the legs. But getting him to balance in positions is a trick. His head is quite tight as well. Value/Price: 7 Onslaught is pretty easy to find at discount stores. I wouldn�t pay full price for him though, as the value just isn�t there save for the Combiner feature. Overall: 5 Just average. 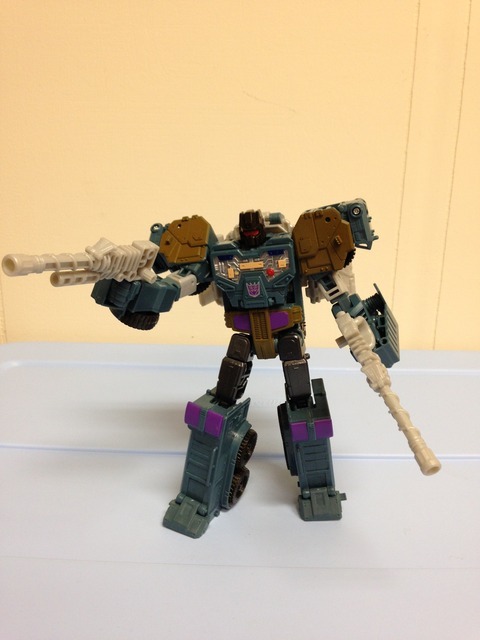 There�s a lot to like with Onslaught, and the robot mode is a good representation of the character. 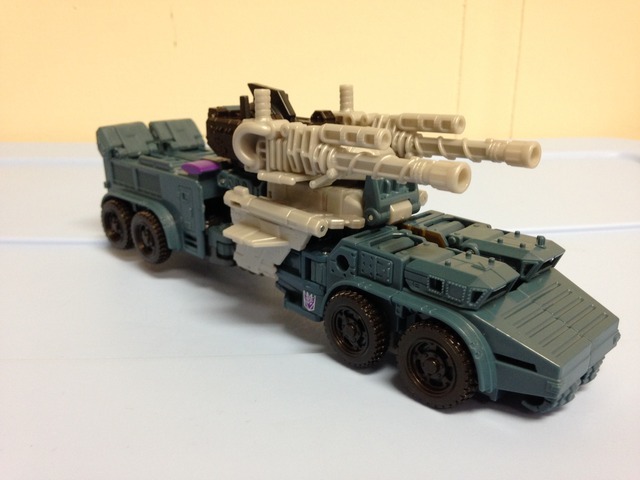 The anti-aircraft truck mode is a miss, and it�s difficult to get him to stand/balance in a few poses. He�s more likable if you get him at a discount, or as part of Bruticus.